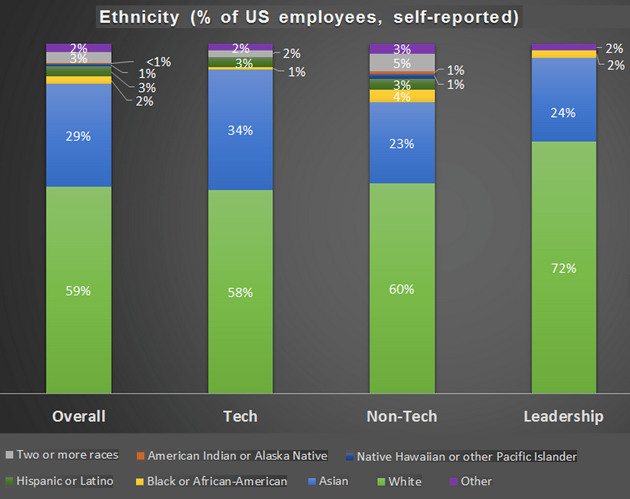 Twitter Releases Its Diversity Stats. And Boy, Are They Embarrassing. In case you’re wondering, other large tech companies have significantly better gender diversity (though it’s still abysmal compared to professions such as law or medicine). At Facebook and Yahoo, 15 percent of tech workers are women. At Google and LinkedIn, it’s 17 percent. In 2010, Mike Swift of the San Jose Mercury News found that women held 24 percent of computer and mathematics jobs in Silicon Valley and 27 percent of those jobs nationally (though those categories may be broader than how they’re defined by leading tech companies, as Tasneem Raja explores in this great piece on America’s growing gap in tech literacy). Jackson argues that improving Twitter’s diversity isn’t just the right thing to do; it’s also a good business decision. It turns out that “Black Twitter” isn’t just a meme. According to a recent Pew survey, 22 percent of African-American internet users are on Twitter, while only 16 percent of White internet users tweet. Meanwhile, usage of Facebook, LinkedIn, and Google+ is roughly the same between Blacks and Whites.